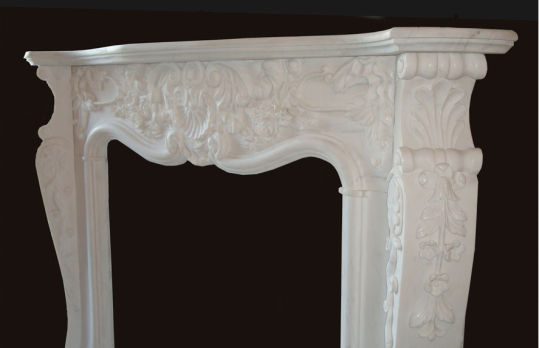 When thinking of fireplace mantels, you might be surprised on the variety and selection that is currently available. While you might enjoy the simplicity of a basic mantel to offset your fireplace, there are many more options to consider when finding the right fireplace mantel for your home. You can choose a mantel based on composition, design, detail, or color. Natural stone is a good choice for choosing a durable mantel that will last for years to come. You may wish to choose the design or style of your mantel as the focal point for your room and change your furnishings and decor around it. You may prefer to choose a mantel that is more fitting with your existing furnishings or to complement your existing decor. Modern fireplace mantels have smooth, clean lines to fit well with nearly any decor. Minimal detail allows the mantel to enhance your fireplace without detracting from the interior design features and furnishings you have chosen for the rest of the room. Marble fireplace mantels are now available in more trending colors, including yellows and reds, to fit in with a more modern appeal to fit nearly any interior design. Stop in to the SoCal Fireplace Mantels showroom for an extensive selection of fireplace mantels to help you decide on what will fit well with your room. If you cannot find exactly what you are looking for, a design expert can help determine if a custom fireplace mantel will be a better option for you.